"We've got a lot to improve on like coach (Steve) Coury was talking about, but this one for sure feels good," said Lake Oswego junior wide receiver Casey Filkins, who scored two touchdowns, caught two passes for 55 yards, rushed once for a yard, completed one pass for 5 yards and recovered Jesuit's onside kick with 1:04 left in the game. "I think we're heading in the right direction." "We came out ready to play. We had a great game plan. Our coaches did a wonderful job setting us up," said Lake Oswego junior wide receiver/defensive back Joe Hutson, who made two catches for five yards and also picked off a Jesuit pass in the end zone early in the game. "I thought our defense played great tonight. I thought the 'D' line did an excellent job stopping the run." With the win, the Lakers improved to 2-0 on the season, while the Crusaders fell to 1-1 after beating Mountainside in their 2018 Metro League opener. "I'm so proud of our team this week. This was a great game," said Jesuit senior linebacker Zach Carr, who had a big sack early in the contest and helped the Crusader defense limit Lake Oswego to 276 total yards on offense. "We played hard the whole time. It wasn't us losing — the clock just ran out on us." "I'm really proud of our team. We fought hard all throughout the game," added Jesuit junior wide receiver Joey Gatto, who made two catches for 26 yards and one touchdown. "We'll bounce back from this. We never gave up — that's the most important thing." Friday's first half was dominated by defense, with Jesuit forcing punts on Lake Oswego's first three possessions while the Lakers stopped the Crusaders' first possession with a Hutson interception in the end zone and forcing Jesuit punts on the team's other three possessions. But Lake Oswego came through with the only touchdown of the opening half on its fourth offensive series, marching 72 yards on six plays to score when Brackin took a dive up the middle, broke two Jesuit tackles and smashed into the end zone at the end of a 35-yard run. Junior Diyar Dezay added the extra point to give the Lakers a 7-0 lead with 3:45 remaining in the opening half. "The line always blocks amazing," Brackin said. "I love every single one of those guys. I trust every single one of them with my life." Earlier in the series, Brackin went over left tackle for 21 yards, got stripped by the Jesuit defense, but saw the Lakers recover his fumble at midfield. The two defenses continued to flex their muscles in the second half, with Lake Oswego forcing a punt on Jesuit's first possession, and the Crusaders creating a fumble by LO's Chris Todd that Jesuit senior Ty Scearce recovered at the 7-yard line. But the Crusaders managed just one first down there, and when senior Joe Angeli tried to punt with his team at the 10, McGuire broke through to block the kick and saw senior teammate Asher Corbett recover the ball at the Jesuit 1. On the next play, Filkins took the snap in the wildcat formation and bowled into the end zone to give his team a 14-0 lead with 3:07 remaining in the third period. Things got worse for Jesuit before they got better, too. After another Jesuit punt — the team's sixth straight — the Lakers put together a 58-yard, nine-play scoring drive that took just 3:24 off the clock and culminated when Laker senior quarterback Jackson Laurent hit Filkins in the left flat. He broke a tackle there, sped 31 yards to score and gave his team — after the PAT was blocked — a commanding 20-0 lead with just 8:55 remaining to play. But the Crusaders, to their great credit, did not die. After taking possession at their own 24-yard line, the Crusaders needed just one play to score, sending junior running back Andy Alfieri over the left side for a 76-yard touchdown run, and teammate Brian Coen added the extra point to cut their team's deficit to 20-7. Then, after a three-and-out by Lake Oswego, Jesuit pieced together an 88-yard scoring drive that took 16 plays, burned 5:12 off the clock and ended when Gatto hauled in a TD pass from senior quarterback Will Spitznagel with 1:05 left to play. Coen's ensuing PAT cut Jesuit's deficit to just 20-14. But Filkins recovered the ensuing onside kick at the 49-yard line and the Lakers ran out the clock on their victory. "I'm on the left side of the field and I was just saying to myself, obviously, 'Don't drop it, and they can't hit me if I go in front of 10 yards' so that was kind of my mindset, to scoot up a little bit and go get the ball and it worked out," Filkins said. While disappointed with the loss, the Crusaders said they had learned lessons from the defeat that would benefit the team in weeks to come. "I think the big difference this week was, honestly, we needed to come out a little faster on offense at the beginning," Carr said. "We were a little slow at the beginning, but I'm incredibly proud of how our offense played." "We came back, (Spitznagel) played a hell of a game, our offensive line did great, everyone did their jobs and it is what it is, but we'll be back," Gatto said. For the game, Brackin carried 16 times for 126 yards and one touchdown, Laurent connected on 14 of 20 passes for 158 yards and one TD, with junior Thomas Dukart making six catches for 62 yards and Filkins two for 55. For Jesuit, Alfieri carried 15 times for 123 yards and one TD, junior back Kade Wisher added 54 yards on eight carries, and Spitznagel ran nine times for 46 yards. Spitznagel completed 8 of 19 throws for 87 yards with one TD and one interception. 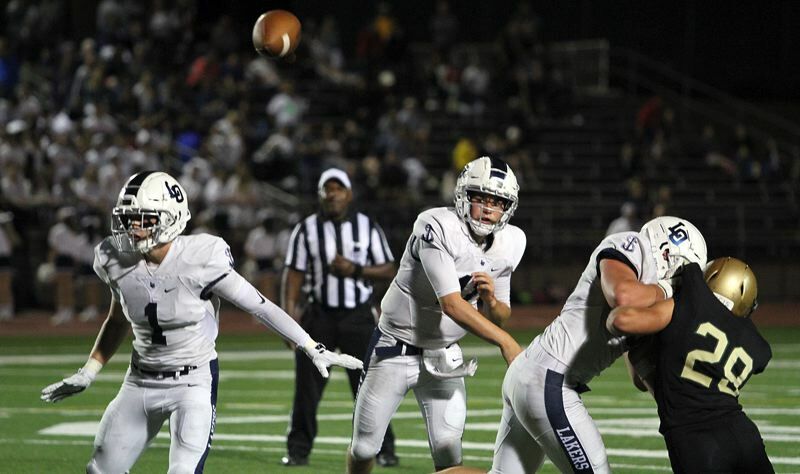 On Friday: Lake Oswego hosts Oregon City (1-1) in Three Rivers League play at 7 p.m., while Jesuit hosts Westview in Metro play at 7 p.m.
To see a complete photo gallery from this game click here.